I was recently pointed towards www.reportspammers.net, which is a good resource for all things spam related and is steadily increased the quantity and quality of the information available. As much as I like the statistics that can be gathered from honeypot systems, live and real stats are even better and the data utilised by Report Spammers is taken from the email clusters run by Email Cloud. One of the first resources released was the global map showing active spam sources (static image below), it is updated hourly and the fully interactive version can be found here. In addition to the global map, Report Spammers also lists the most recent spamvertised sites seen on it’s mail clusters. I’m undecided with the ‘name and shame’ methodoly due to the risk of false postives, but if your looking for examples of spamvertised sites it will prove a good resource (and one I intend to delve deeper into next time I’m bored). Just beware, sites that actively advertise via spam are rarely places that you want to point you home browser at, you have been warned. If you are wanting a resource to explain spam and the business model behind it Report Spammers could be a good starting point. It even has the ability to explain spam to non-infosec types that still think spam comes in tins. Keep this in mind next time you need to run another information security awareness campaign. Which seems to be a lot, and from the responses I seem to be behind the curve in contactability. All this makes me wonder, in a world where outdated and not updated client applications are a growing intrusion vector do we really need all these ways for people and systems to communicate with us? While you’re thinking, are they any of your communication tools that you could do without? If you stopped signing into MSN (for example) would you lose contact with anyone who couldn’t contact you via a different communication channel? I’m not sure if there is a purpose to these thoughts or the very unscientific findings, but I’ve been thinking about this for a while so thought I’d share. P.S. thanks to those who participated, you know who you are. As part of a new and improved environment I’ve just finished building up a new Dionaea system. Despite the ease at which I found the install of my original system I received a lot a feedback that others had a fair amount of difficulty during system build. So this time around I decided to pay closer attention to by progress to try and assist others going through the same process. Unfortunately I’m not sure I’m going to be able to offer as many pearls of wisdom as I originally hoped as my install went relatively smoothly. Only real problem I hit was that after following Markus’ (good documentation) my build didn’t correctly link to libemu. Bottom line, keep an eye on the output of ./configure when building Dionaea. In my case the parameters passed to the configure script didn’t match my system so needed to be modified accordingly. Last night (2010-01-20) I had the pleasure of attending the launch event for NEBytes. The launch event was done in conjuction with the Sharepoint User Group UK (SUGUK), so was no surprise when the first topic of the night covered Sharepoint 2010, delivered very enthusiastically by Steve Smith. I’ve got no experience with Sharepoint so can’t comment too much on the material, but from the architectural changes I got the impression that it 2010 may be more secure that previous versions as the back-end is becoming more segmented, with different parts of the whole have discrete, dedicated databases. While it might not limit the threat of a vulnerability, it should be able to reduce the exposure in the event of a single breach. Steve also highlight that there is some very granular accountability logging, in that every part of the application and every piece of data recieves a unique ‘Correlation ID’. The scenarios highlighted suggested that this allows for indepth debugging to determine the exact nature of a crash or system failure, by the same system this should allow for some good forensic pointers when investigating a potential compromise or breach. Again viewing the material from a security stand point I was concerned that the defaults that appeared as part of Steve’s walkthrough defaulted to less secure options, NTLM authentication not Kerberos and non encrypted communication over SSL. One of Steve’s recommendations did concern me, to participate in the Customer Experience Improvement Program. While I’ve got no evidence to support it, I’m always nervous about passing debugging and troubleshooting information to a third party, never know what information might get leaked with it. From a developer and designer perspective Silverlight must be great, the built in functionality provide access to capabilities that I could only dream about when I was looking at becoming a dev in a past life. The intergration between Visual Studio for coding and Blend for design was equally impressive. Again I viewed the talk’s content from a security perspective. Mike pressed on the fact that Silverlight runs within a tightly controlled sandbox to limit functionality and provide added security. For example the code can make HTTP[S] connections out from the browsing machine, but is limited to the same origin as the code or cross domain code providing the target allows cross domain from the same origin. The final talk was actually the one I was most interested in at the start of the night, and was presented by James O’Neil. In the end I was disappointed, unlike the other topics I didn’t get too much that was new to me from the session, I’m guessing because virtualisation solutions are something I encounter on a regular basis. Only real take-away from the talk was the James gets my Urgh! award for using the phrase ‘private cloud infrastructure’ without cracking a smile at the same time. The night was great, so a big thanks to the guys that setup and ran the event (with costs coming out of their own pockets too). The event was free, the topics and speakers were high quality and to top it off there were some fairly impressive give aways as well, from the usual stickers and pens to boxed Win7 Ultimate packs. If you’re a dev or IT professional, I’d definitely recommend getting down to the next event. a small daemon that creates virtual hosts on a network. The hosts can be configured to run arbitrary services, and their personality can be adapted so that they appear to be running certain operating systems. Honeyd enables a single host to claim multiple addresses – I have tested up to 65536 – on a LAN for network simulation. 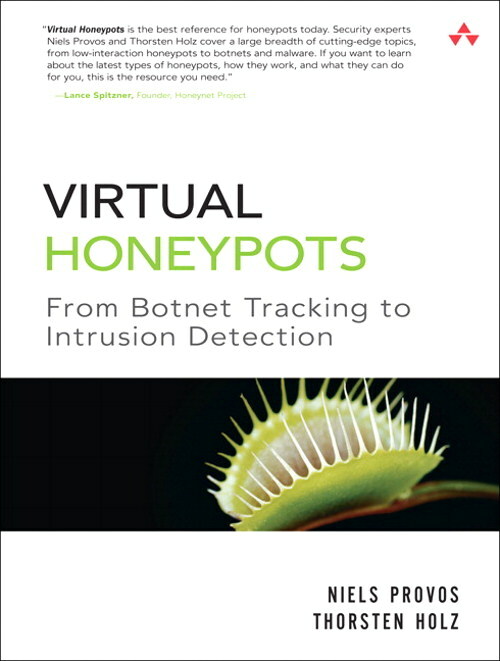 Honeyd improves cyber security by providing mechanisms for threat detection and assessment. It also deters adversaries by hiding real systems in the middle of virtual systems. My initial experience getting HoneyD running was frustration to say the least. Going with Debian to provide a stable OS, the install process should have been as simple as apt-get install honeyd. While keeping upto date with a Debian system can sometimes be difficult, the honeyd package is as current as it gets with version 1.5c. For reasons that I can’t explain, this didn’t work first (or second) time so I reverted to compiling from source. The process could have been worse, only real stumbling block I hit was a naming clash within Debian’s package names. HoneyD requires the ‘dumb network’ package libdnet, but if you apt-get install libdnet you get Debian’s DECnet libraries. On Debian and deriviates you need libdumbnet1. HoneyD’s configuration has the ability to get very complex depending on what you are looking to achieve. Thankfully a sample configuration is provided that includes examples of some of the most common configuration directives. Once you’ve got a config sorted (the sample works perfectly for testing), starting the honeyd is simple: honeyd -f /path/to/config-file. There are plenty of other runtime options available, but I haven’t had time to fully experiment with all of them; check the honeyd man pages for more information. As well as emulating hosts and network topologies, HoneyD can be configured to run what it terms ‘subsystems’. Basically this are scripts that can be used to provide additional functionality on the emulated systems for an attacker/user to interact with. Some basic (and not so basic) subsystems are included with HoneyD. Some additional service emulation scripts that have been contributed to the HoneyD project can be found here. As part of the configuration, HoneyD can also pass specified IP/Ports through to live systems, either more indepth/specialised honeypot system or a full ‘real’ system to combine low and high interaction honeypot. I’m still bearly scratching the surface of what HoneyD is capable of, and haven’t yet transfered my system to a live network to generate any statistics, but from my reading, research and experimentation I have high expectations.